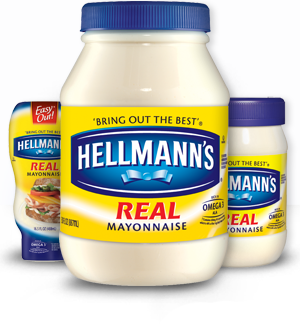 From a nutritional standpoint, yes, the concept of real mayonnaise is healthy. Fat, eggs, vinegar, and sea salt, what could better? Despite all of the debate over whether fats are healthy for us, they ultimately are our bodies fuel down to the very cellular makeup. Without fat, our bodies would not be able to survive, making the concept of a low-fat diet not only very detrimental to an individual, but also seemingly impossible to succeed in. Why? Because our bodies absolutely need, and thus crave, good ol’fat. The problem that has risen in the past few decades is the industrialization of our food. Instead of fat coming from unprocessed, raw, whole sources, fat (especially in polyunsaturated varieties) is heavily treated, thus causing them to oxidize and become harmful to our bodies. Just a few of these vegetable and seed derived fats include soybean, canola, corn, peanut, cotton, sunflower, safflower, and grapeseed seed oil. To summarize my previous “Fat Phobia” series, whether or not a fat is healthy ultimately comes down to its chemical makeup. PUFAs (Polyunsaturated fatty acids) are fragile in nature, while the stability rises in monounsaturated varieties. Saturated fats on the other hand, are completely stable, making them the best for high heat cooking. However, preserving the makeup of these fats does not just apply to cooking, but also to how they are handled, processed, and put into what we call “mayonnaise.” Because of the natural form of PUFAs, they should never be heated, yet this does not stop the food industry from using them, as they are undoubtedly the cheapest oils to use. Therefore, whether or not mayonnaise is healthy, is truly an inapplicable question due to fact that it is commonly (if not always) made from oxidized, damaged, and thus dangerous oil. It does not matter where you buy it, whether at Kroger or Whole Foods, if you flip over a bottle of “organic, “real,” “all natural,” and (or) “non-GMO” mayo, the ingredients are anything but beneficial to the body. The term “organic” may be important in some aspects of eating, but it certainly does not change the fragile structure of vegetable and seed oils. Now, is eating a few tablespoons of deranged oil in your weekly tuna salad going to kill you? Not exactly. However, large quantities of these oils, as is the case for the SAD (Standard American Diet), are certainly harmful to the body, and have been proven in various scientific studies, as well trips to the mall’s food court. Because of this, many Primal/Paleo enthusiasts struggle with taking mayonnaise out of their diet. It shouldn’t be deemed “unhealthy,” as the primary ingredients are certainly foods are ancestors have been eating for hundreds of years. That being said, the quest for a Paleo-aligned mayo seems to always end in failure, typically leading people to simply ignore the fact that all mayo is made with oxidized oils, give it up all together, or try and make their own at home. However, the last two options are anything but easy, especially in today’s fast paced world. 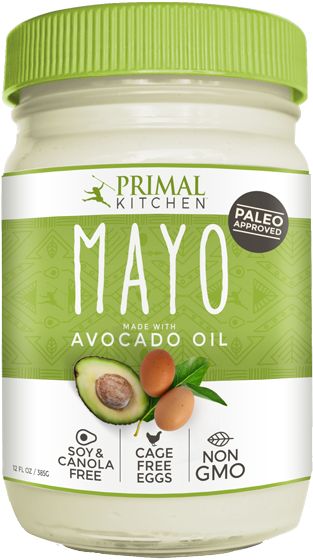 Because of the hassle and frustration that surrounds mayonnaise, the folks from the Primal Blueprint have set out on a “quest for healthy Primal mayonnaise.” Am I excited? Beyond! Even though I cannot tolerate eggs at this point in my illness, they are certainly foods I will be re-introducing later down the road. Therefore, with a love for slathering mayonnaise on everything (a trait passed on from my mother), I am sure Mark Sisson’s mayo will definitely be in my future. Of course, even if I am not eating eggs when it is released, I cannot wait to get my hands on a bottle of this Primal mayonnaise to share with my family! So, what makes their version so much better than the leading supermarket brand? First, it is made with avocado oil, a monounsaturated fat that is more stable in nature, and thus less prone to damage while being produced. This oil is also chock full of health benefits, including reduction of overall inflammation in the body, coronary heart disease, diabetes, metabolic syndrome, as well as liver protection, boosted absorption of nutrients, and other healthy effects that vegetable and seed oils lack completely. Without getting into specifics, Mark’s Primal mayo is something you can feel GOOD about eating and can unashamedly mix into your tuna salad or slather over a juicy burger. Despite the oil not being certified organic, there is no pesticide residue or other harmful toxins present in the product. This is just one reason why it is important to realize that eating “organic” is not the end-all be-all, and should be investigated and questioned just as much as any other label. All in all, this makes the mayonnaise rather cheap, unlike the hefty price tag that it would have if it were “certified organic,” despite the fact that there is no difference between the two. Of course, I feel like a tease writing this post before the mayonnaise is launched. However, I really just wanted to spread the word that there is hope, as well as the fact that a Paleo compliant, healthy, delicious, AND affordable mayonnaise IS COMING! For now, you can enter the Mark’s Daily Apple giveaway, to win a jar of this avocado-based mayonnaise. To learn more about fat, see my previous “Fat Phobia” series, as well as the “Definitive Guide to Fats” on Mark’s Daily Apple.